Professional Educator is produced under the guidance of a Publications Working Group. Publication of any submitted article cannot be guaranteed. Possible reasons for an article not being published may include: the subject of the article is ‘off theme’ for a particular edition or there are space restrictions. Articles that are not published in a given edition may be kept by the College in our publications library for possible use in future editions. Ensuring the article meets the style of the publication is the responsibility of the author. ACE is not able to edit or rewrite papers into style. It is important for potential contributors to be aware that submissions are usually read by a number of members of the ACE Publications Working Group to determine the article’s suitability for inclusion. Each reviewer may raise questions relating to the article including references material, grammar and meaning for clarification. 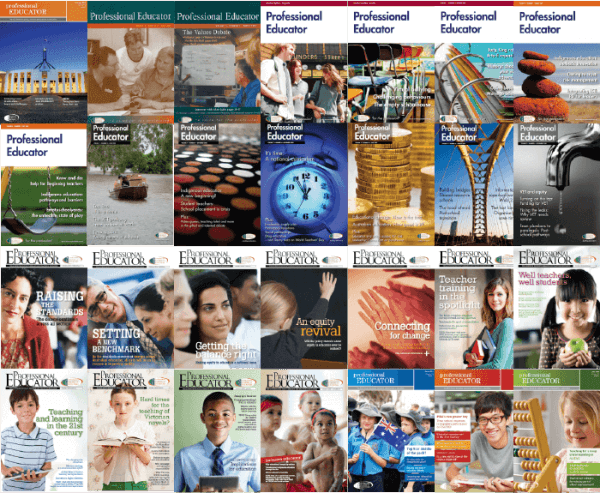 The articles published in Professional Educator include feature, opinion, commentary articles, plus book reviews/columns (500 words) or summaries of new research. In general a feature or opinion article is between 1200–2000 words in length. Professional Educator does not publish full media releases, or news items about events or products/services. Professional Educator’s audience is made up largely of all educators from early childhood, primary and secondary schools, TAFE/VET and higher education sectors. They can have different occupations including early childhood educators, policy officers, teachers, lecturers, researchers, principals, leaders, administrators, students and others with appropriate qualifications, experience or interest within the education sector. Articles will be assessed for publication based on the likely level of interaction with the magazine’s theme plus interest and relevance to this audience. Professional Educator is a ‘light’ academic journal providing accessible information to readers. The style should be ‘plain English’ with clear and simple academic referencing. It is preferred for authors to refer to any research, literature or other publications in the body text of an article to ensure credibility. A short list of references and suggested further reading (of no more than half a column of text) may be included at the end of the article. Due to limited space in the publication, extensive bibliographies will not be published. A feature or an opinion piece is generally around 1200-2000 words in length and sets out an argument for or against a policy or proposal, or makes a call to action. These should be written in the style of newspaper opinion columns. Letters to the editor in response to articles previously published are also encouraged. These should be no more than 150 words in length and must be professional in tone. Articles that are considered by members of the Publications Working Group as primarily promotional or advertorial will not be published. For example, if it seems that the author’s primary aim is to promote to our members the purchase/use of a particular school, product, or service.